Say you fell in love with the retro-modern wedge aesthetics of the Porsche 944, but felt as if it should have been a little more Porsche-like. You know, with its engine in the back—just as Ferdinand Porsche intended. 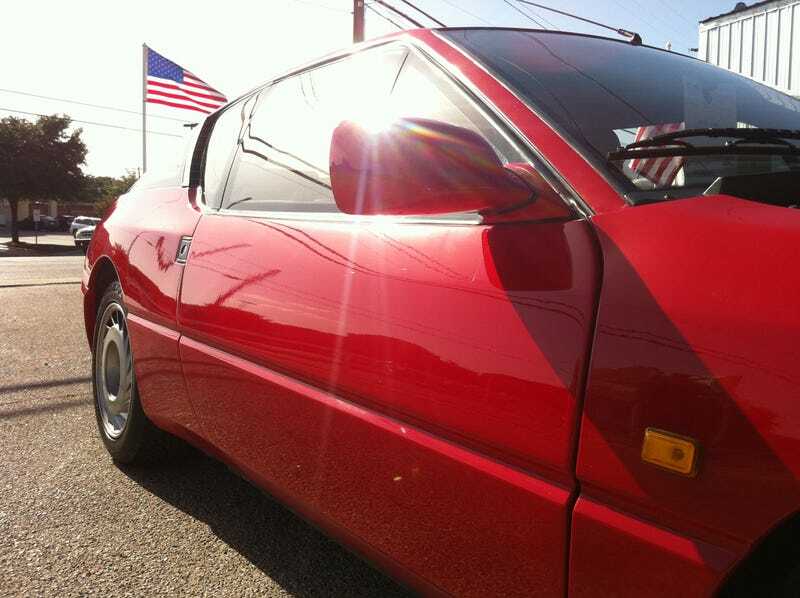 Behold, a Renault Alpine GTA, inexplicably for sale in Texas. Well, I hate to break it to you, but the car you want is actually French, and we didn't actually get it here when it was new. But it comes with a frunk! Never mind that it's minimally usable with the spare tire up there. What matters is that the primary storage area is where it should be: up front. The Renault Alpine GTA is a rear-engined, rear-wheel-drive celebration of the '80s wedge and bizarrely, there's one for sale at Guero's Auto Sales in Austin, Texas. This car in particular was originally a Japanese car, was later imported into Canada, and then the Guero's dealership brought it into Texas from there. It's a 1988 model, so it's fair game for importation into the United States by now. The Alpine is also ideal for fans of '80s wedge cars who wanted something a little more aerodynamic than the usual pop-ups. This car had a few rough edges, like the gaudy aftermarket head unit and several stuck-on pixels in the dashboard display, but overall, the interior was simple, clean, and cozy enough looking to put many modern luxury cars to shame. This back seat is nicer than most couches, too. Although I couldn't take it for a drive since it had just arrived on the lot (and it appeared to need some finishing up before it was ready for sale), I got to start the car and blip the throttle a few times. The V6 turbo in the back lazily whirred to life with each press of the throttle. It felt very analog, as if you could feel how everything was mechanically tied together, just like an '80s sportscar should. "This is so similar to the 944" kept going through my head as I looked through the car: the location of the handbrake, the sharp, geometric styling and the comfortable looking backseat with only enough leg room for a little person, or perhaps a double leg amputee. Certain touches like the small square door latches and the clever layered hatch design were a tad more trendy for the times. Renault took risks with styling that Porsche would rarely (if ever) take. I'd even call it "more French." Around the corner was a pair of Ferrari 400is, both brought in from France. While the front of the lot had your standard random-dealership-on-Burnet fare, these and the Alpine point to a certain "I Love the '80s" aesthetic that would make Antti Kautonen blush. These two automatic cars had a lovely surprise under the hood: a big honkin' V12 shoehorned in there. The fellow I spoke with said that they have an interest in exotics of this era, so that's what they import, and they have plans to bring in more. The twenty-five-year rule for importing foreign-market cars is rather pointless and silly, but this dealer certainly proved that there's more out there that's legal to import than the oft-publicized R32 Skyline. What interesting cars would you import? I, for one, would love a cheap Trabant or a Brazilian-market aircooled VW for LeMons, or an E30 Touring for everything else, but those are pretty obvious choices. If anyone's drooling over anything a tad more obscure, it looks like I've stumbled upon your soulmates.